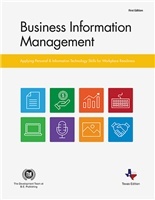 Business Information Management is a comprehensive, skills-based textbook. Students use their computer applications skills to produce professional business documents. With a strong focus on workplace readiness and communication and writing skills, students reinforce their touch typing skills, create word processing documents, develop spreadsheets, build databases, design desktop publishing documents, and make digital presentations using the appropriate software for the task at hand. Students also explore the vital role technology has in the workplace, including the importance of managing information systems. This textbook culminates with students working in teams while collaborating on a final assessment. Meets 97% of the TEKS for Texas Proclamation 2017 Textbook Adoption. Additional lessons have been added to Unit 7 on the Companion Site to meet the remaining 3% of the TEKS. Culminating Final Project: Pitch It! This textbook concludes with a culminating final project called Pitch It!. In this mini-simulation, students utilize their information technology skills as they work in teams to create a new product and introduce it to the market. 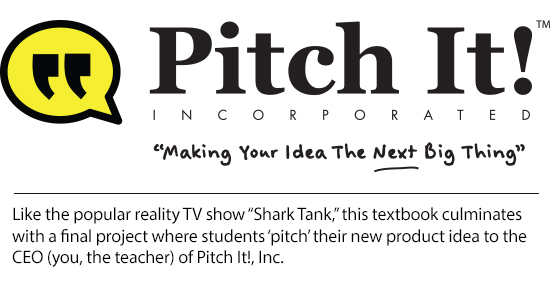 As young entrepreneurs, students are required to research and develop a variety of documents that they will use to support and "pitch" their idea to the CEO of Pitch It!, Inc. (the teacher), similar to that of the popular reality TV show, "Shark Tank." Students will ultimately experience exactly what happens in the real world where aspiring entrepreneurs create "elevator pitches" to potential investors. The goal of this final project is simple: To have Pitch It!, Inc. hear and love the students' ideas so that they receive the necessary financial backing to bring their product to market. 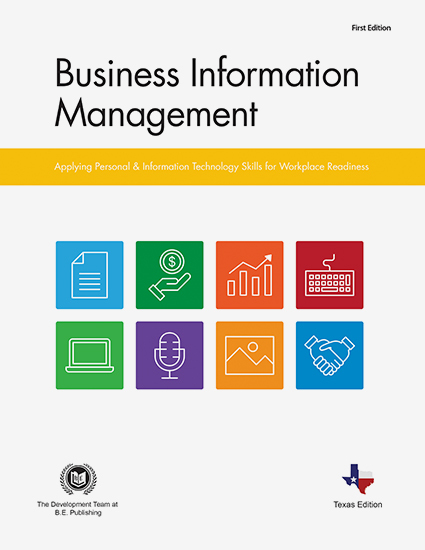 The Online Instructor Resources for Business Information Management include Lesson Answer Keys, Lesson Source Files, Grading Rubrics, and Review Worksheets and Assessments. Lesson Source Files offer instructors the option to conserve class time spent keying each lesson's text and data, or to require students to key for additional practice. Review Worksheets and Assessments assess students' knowledge and ask them to demonstrate their computer applications skills. Review Worksheets measures students' knowledge of the topic or computer application introduced in each unit. Question types include true/false, short answer, and real-world scenarios, in which students use critical thinking to apply what they know to a realistic situation. Assessments measure students' ability to demonstrate their knowledge of the topic or computer applications skills in each Part. Each project in the culminating final project called Pitch It! is accompanied by a Planning Form that guides students in the creation of their new product. Several lessons throughout the book require students to insert logos to create professionally-styled documents.